Who is in the mood for an electrocution? Or, how about some neck biting action? 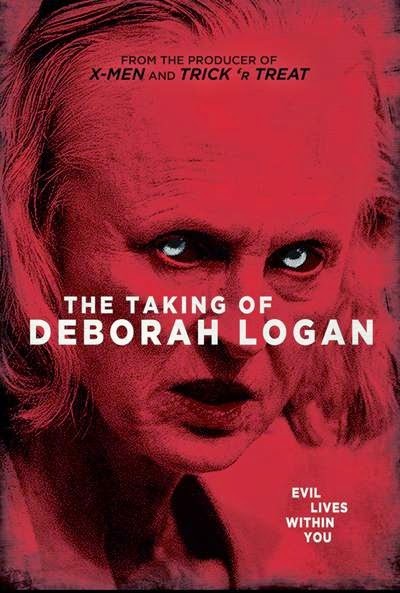 All of these bloody events, and many more, take place in the Red Band trailer for The Taking of Deborah Logan. This film, from director Adam Robitel is a found footage film, in which one women succumbs to Alzheimer's Disease. If that was not enough, Deborah is also tormented by snakes and an evil presence. The Taking of Deborah Logan stars Jill Larson as the protagonist and the focus of study, along with Anne Ramsay and Michelle Lang. The film's frightening Red Band trailer is here. For more on the story, Deborah's daughter is completing her PHD on Alzheimer's. Mia is documenting her mother's decline into dementia, until something even more disturbing occurs. Something has possessed Deborah and it wants everyone else to die! The Red Band trailer offers all sorts of thrills and chills. The clip begins normally enough as daughter Mia talks into the camera. As night descends, a malevolent force is unleashed through Deborah's body, leading to all sorts of murder. Horror fans should slow the clip in the latter third to see some of the frights that await, October 21st, 2014. Release Date: October 21st, 2014 (DVD). Writers: Gavin Heffernan and Adam Robitel. Cast: Jill Larson, Anne Ramsay and Michelle Ang. Millenium Entertainment. Youtube Account. 16 Sept. 2014.